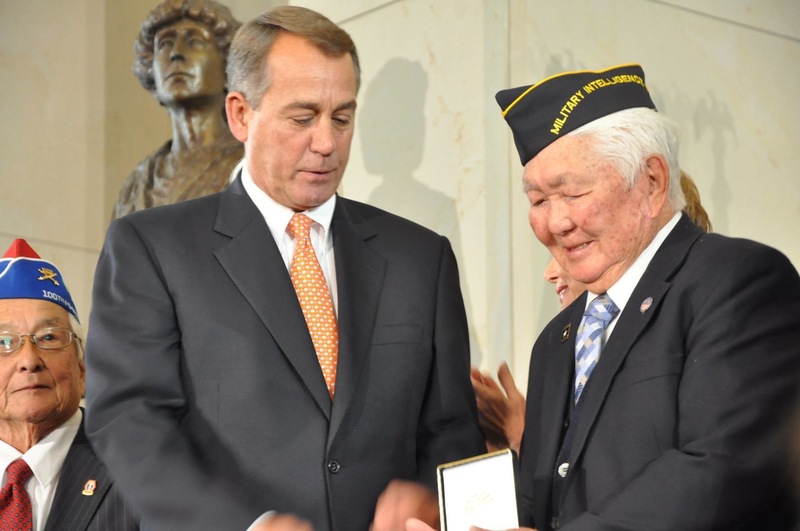 MIS veteran Grant Ichikawa receiving the Congressional Gold Medal from then-House Speaker John Boehner during a ceremony at the U.S. Capitol in 2011. “It is with a heavy heart that JAVA is sharing the news of Grant’s passing. He was 98 years young. He was a beautiful person who decided to serve his country at the age of 23. “He was known and loved by many people. Not only did he serve in the MIS in World War II, he served the JA veterans’ community for many years through JAVA and others’ efforts. He started the Round Robin in 2003 as a way to get information out quickly to veterans. In addition to many other efforts, Grant collaborated with others on a project to compile a roster of approximately 6,000 full names of MISers who attended the MIS Language School (MISLS). Ichikawa graduated from UC Berkeley with a degree in accounting, but because no one would hire a Japanese American accountant, he became a fruit farmer with his father. After Pearl Harbor was bombed, the family was incarcerated at the Gila River, Ariz. camp. It was there that he was recruited by the MIS, which needed bilingual Nisei who could serve as translators and interpreters in the Pacific Theater. After serving with the occupation forces in postwar Japan, where he surveyed the impact of the atomic bombs on Hiroshima and Nagasaki, he was discharged in 1947 as a second lieutenant, but was recalled during the Korean War. There he was recruited by the CIA because of his background in intelligence, and he served in a variety of capacities until the end of the Vietnam War. He was among the Americans evacuated from Saigon when it fell to the North Vietnamese. Services will be held on Saturday, Dec. 16, at 11 a.m. at Money and King Funeral Home, 171 Maple Ave. W, Vienna, Va.; (703) 938-7440. A celebration lunch will follow at Harvest Moon Restaurant, 260 Arlington Blvd., Falls Church, Va. In lieu of flowers, the family requests that donations be made to the JAVA Scholarship Program.